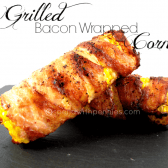 This Bacon Wrapped Corn takes corn on the cob to a whole new level! It can be grilled or baked in the oven.This is something I can’t wait to play with more. I have tried a jalapeño cheese grilled corn (with some issues) so I am still working on it.. but the addition of the grill makes the corn so darn delicious! Husk each ear of corn. Wrap the bacon around each corn ensuring it overlaps. You will need two slices per ear of corn because the bacon shrinks. Sprinkle with pepper.